Knoch Knolls Nature Center and its hiking trails present a wealth of nature explorations for families. The preserve is at the confluence of the West Branch of the DuPage River and the East Branch of the DuPage River. The rivers along with another pond near the nature center yield beautiful views. The preserve also includes forest and prairie ecosystems as well as a selection of outdoor activities. Enjoying a view of the West Branch of the DuPage River and a bike bridge in the distance. 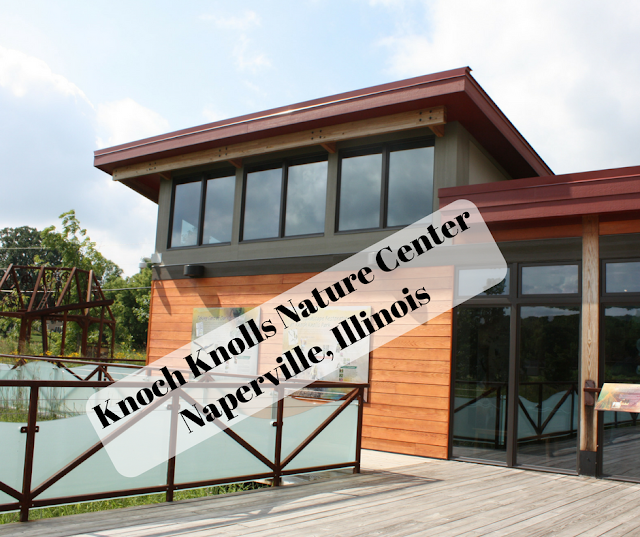 We began our visit exploring the Knoch Knolls Nature Center. While not huge, the informative plaques and hands-on elements pique curiosity and acquainted with the history of the area as well as native wildlife. Informative plaques inside and out acquaint visitors of Knoch Knolls to the wildlife, environment and history of the area. On the way in, we noted a sculpture memorializing the frame of one the area's first settler's sawmills. The sculpture is pretty intriguing. An intriguing reproduction of a sawmill. A number of elements draw attention including this water wheel. Inside, we explored a smattering of exhibits and I enjoyed learning more about animal fur! Some exhibits have hands-on components. Stone bridge melding into the forest. The preserve is beautiful with about 5.5 miles of trails. Some of the trails going through the preserve are part of the DuPage River Trail which is also great for bikes. The trail is currently in segments that are not completely connected. The goal in the future is for it to encompass 40 miles. Wow! Learning about the first claim in the DuPage River confluence area. While on the trails, we found a little more info about the Scott family who had the first claim on the confluence. After, we took a bit of a rustic path. The views of and from the bike bridge were lovely! 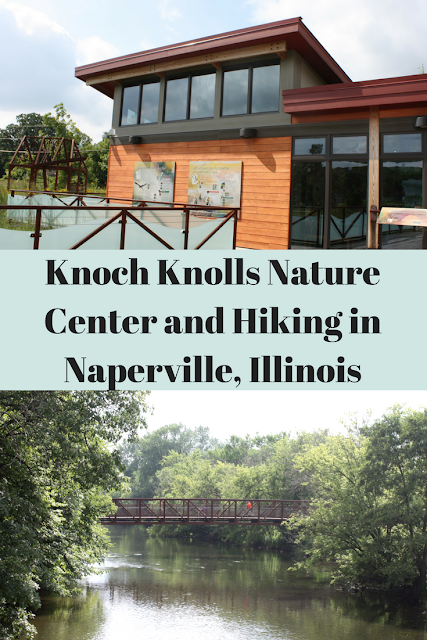 We enjoyed out first exploration of Knoch Knolls. We were on a bit of limited time during our visit but we love Naperville and will definitely return in the future! The preserve has a disc golf course. There is a boat launch for small boats and kayaks. Kids will enjoy a playground as well as the Nature Center. Restrooms are at the Nature Center. You can fill up your water bottle outside of the Nature Center.